C1183. CHARLES MUNCH Cond. NYPO. 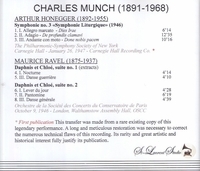 : Symphonie Liturgique Symphony #3 (Honegger), Live Performance, 26 Jan., 1947 (from a rare existing copy, albeit with numerous technical flaws); Munch Cond. Paris Conservatoire Orch. 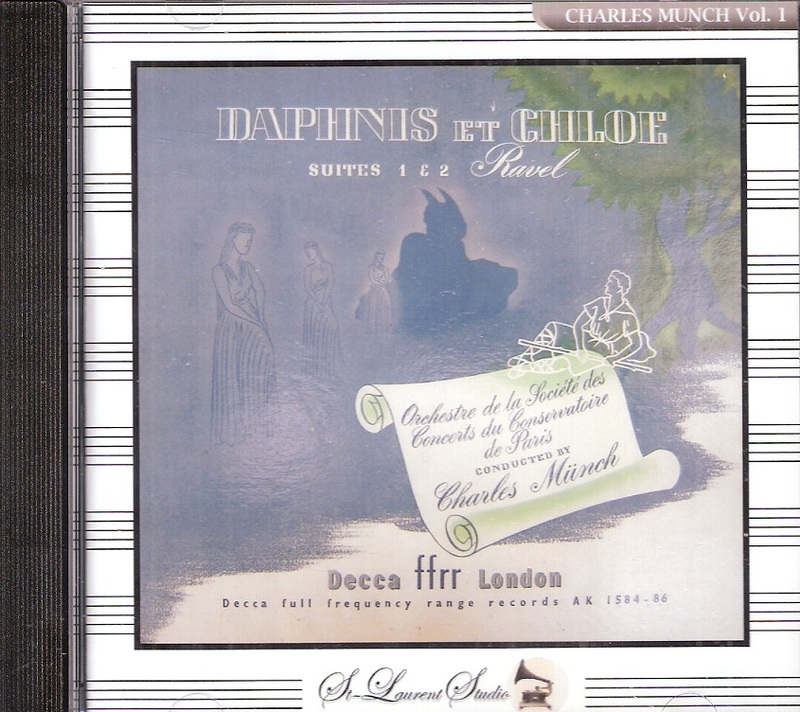 : Daphnis et Chloé - Suites Nos.1 & 2 (Ravel), recorded 9 Oct., 1946, Walthamstow Assembly Hall, London. (Canada) St Laurent Studio YSL 78-166. Transfers by Yves St Laurent. "Composed in the aftermath of World War II, the Symphonie Liturgique is one of Honegger's best-known works. It is in three movements, each of which (following the symphony's subtitle) is named after part of the Requiem Mass. The first movement, Dies irae, is marked allegro marcato, and has an aggressive, storm-like quality. The slow movement, De profundis clamavi, is in contrast meditative and lyrical. The finale, Dona nobis pacem, is more episodic, with an insistent, brutal marching rhythm building to a dissonant climax, before a long, lyrical coda concludes the work. A melody resembling the robin song from JEANNE D'ARC AU BUCHER, can be heard towards the end of each movement. Honegger himself wrote an extensive commentary on the work, making explicit the music's connection with the horrors of the War, and the desire for peace. 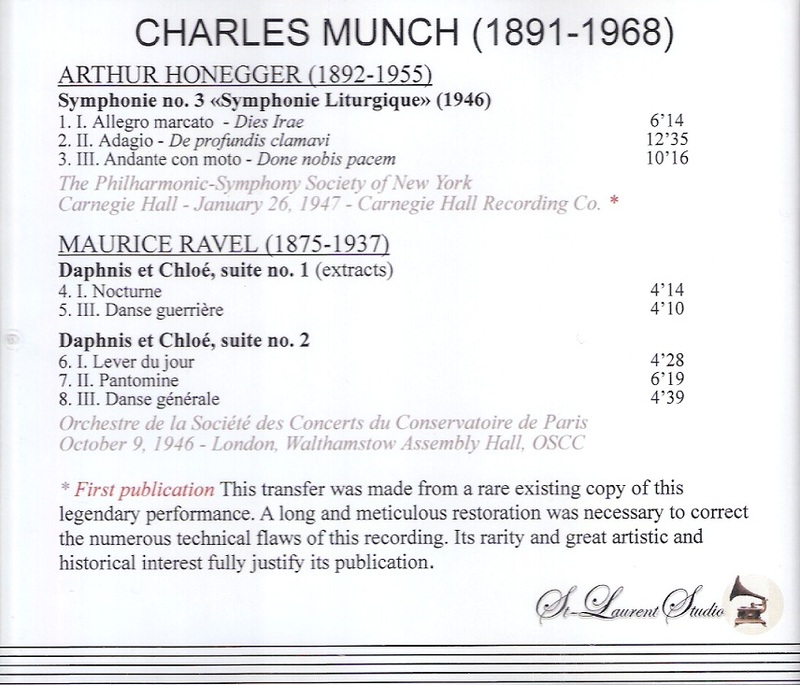 Written in 1945-46 on a commission from the Foundation Pro Helvetia, Honegger's Third Symphony was first performed in Zurich on 17 August 1946 with Charles Munch conducting the Suisse Romande Orchestra."